Cabbage vegetable is leafy vegetable and is round or oval in shape. It is belongs to the family of Brassica and it is originated in Eastern Mediterranean and Asia Minor. Varieties of cabbages available include Savoy, Wombok, January King, red, and green cabbages. The taste is varies from savory to gently sweet. They can be eaten raw or cooked. They are available year around. Cabbages are used in number of ways but most commonly used in salads, curries. Cabbage is a good source of vitamin C, vitamin K, dietary fiber. 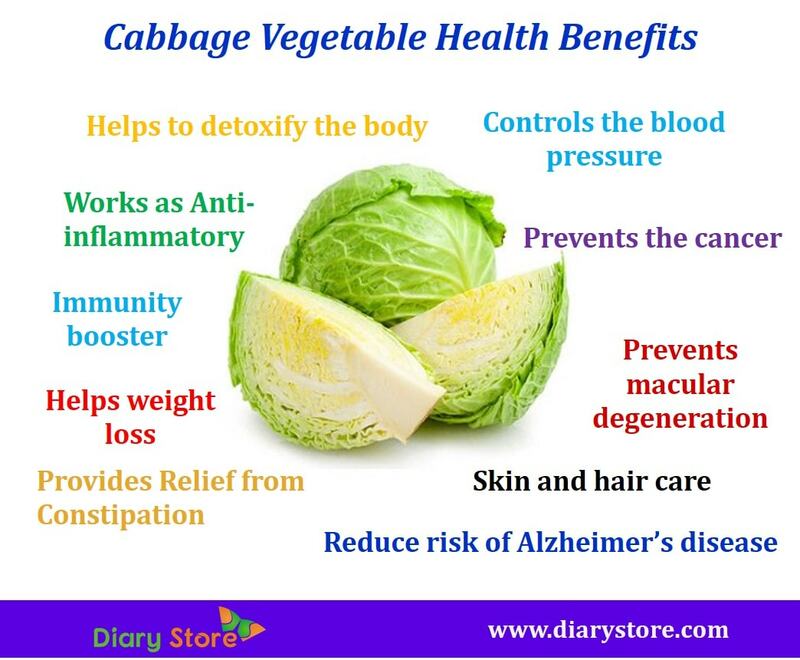 Cabbage vegetable provides lot health benefits and it’s worth adding this power food in your diet. Cabbage packed with vitamin, Minerals, carbohydrates, proteins, antioxidants. Here below listed the nutrition value per 100 grams (3.5 Oz), percentage of RDA (Recommended Dietary Allowance). Cabbage contains well known anti-cancer compounds includes lupeol, sinigrin and sulforaphane. These compounds help to fight against the cancer causing cells. Cabbage is low in calories and high in fiber. One cup of cabbage contains only 33 calories. So it’s ideal for weight loss. Cabbages are rich in vitamin K and anthocyanins especially in red cabbage that help to reduce risk of Alzheimer diseases and also prevent nerve damage. 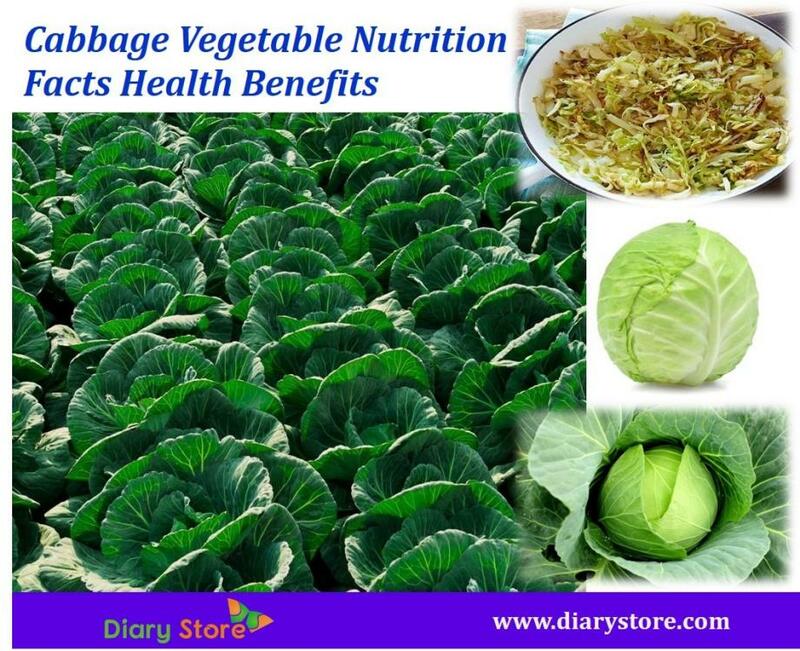 Cabbage is rich in vitamin C, thus cabbage helps in strengthen the immunity system. Cabbage contains beta-carotene content, which is helps in prevention of macular degeneration of the eyes. Cabbage contains anti-inflammatory properties which are help those who are suffer from joint pains and arthritis. Cabbage is rich in potassium content which is helps keep blood pressure from getting high. Cabbage contains high amount of vitamin C, and sulphur. Which are removes the toxins such as free radicals and uric acid. Free radicals and uric acid are the main causes of arthritis, skin diseases, rheumatism and gout. Due to good amount of fiber presence in cabbage helps in providing relief from constipation. Cabbage is good source of antioxidants includes vitamin C, vitamin E, vitamin A anthocyanins, iron, sulphur and other. Antioxidants play a major role in skin and hair health. Vitamin C keeps the skin youthful and delays the aging process, vitamin E improves Skin Complexion. Vitamin A and iron Stimulates Hair Growth. Cabbage contains sulphur which is prevent the hair loss and nourishes your hair. Excessive consumption of cabbage may lead to gastric problems.